Decision management is a discipline and set of technologies focused on helping you design, build, and manage the decisions that are automated in your software applications and systems. Decision management platforms provide an environment where business and data analysts can define, test, and deploy decisions into your operational environment as decision services. Once deployed, you can invoke a decision service from systems, processes, and other services, at the point in time you need to make a specific decision in the business application. With decision management, you can monitor and optimize the decisions that are made in your applications and systems. To do this, you define metrics and key performance indicators that enable you to measure the results of your deployed decisions. By monitoring and measuring your decision results, you will better understand when to how to improve your decision strategy. Decision management encompasses not only the automation of decisions but more importantly, it enables the cycle of monitoring, adjusting, and dynamically refreshing and improving those decisions. Decision management is used by organizations in all industries in applications that automate decisions related to risk, compliance, and configuration. Decisions are the central concept in decision management. Traditionally, software development has focused on the automation of processes and functions to gain operational efficiencies. There was little attention to the actual business decisions that guide those processes. As a result, the code responsible for making those decisions was most often throughout the system in databases, processes and user interfaces, so it was difficult to maintain and evolve. Decision management has emerged as the key discipline to strategically manage automated business decisions. With decision management, the code responsible for making these decisions is treated as a separate asset. It is to business decisions what business process management is to business processes and database management is to business data. Today, companies are turning to decision management as they strive to make better decisions that more effectively manage risk and improve customer experience. Companies using decision management benefit from agile and targeted automated decisions that leverage data and analytics to improve their business outcomes. In decision management, you separate decisions from the applications and processes that use them so they can be managed and changed independently on a cycle driven by the needs of your business. This separation makes it quicker, easier, and less costly to change the decision approach when market circumstance or the regulatory environment dictate. You can make, test, and deploy changes to decision services outside of your normal software development cycle. Rather that waiting weeks or months for the IT organization to make needed updates and changes, they can be made by business analysts on a timeframe set by the business. Decision management brings the decision closer to the business by providing a business-friendly representation of the decision so that business analysts can define the how the decision is made using decision flows, business rules, and models. 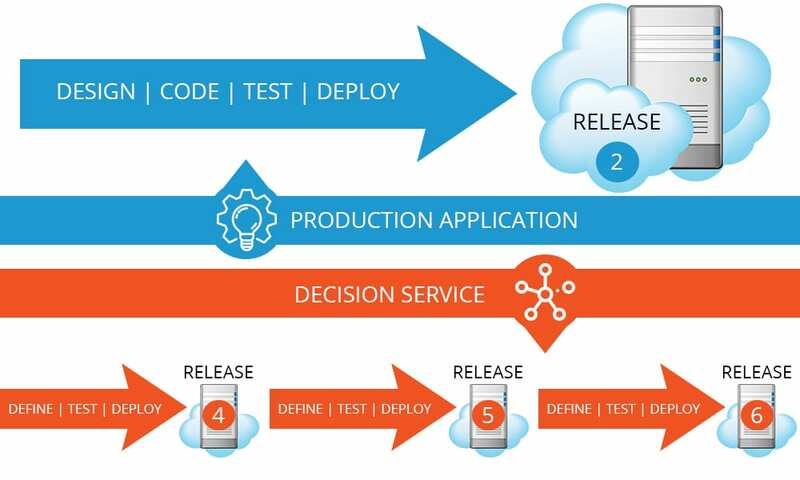 As you define your decision, you can test and run simulations to validate the decision approach and when ready, you can deploy the decision to a production decision service. In a decision management platform, you can combine business rules and predictive models to specify how an automated decision is made. Rather than taking a one-size-fits-all approach to decisions, where each customer or transaction is treated the same way, decision management helps organizations leverage data to make more specific and targeted decisions. Many decisions today are dependent on customer behavior and therefore involve some degree of uncertainty. These decisions benefit from real-time predictive models that indicate future probabilities and trends where the output from the model is a predictive score that can be used to define the desired action. The specific decision approach that you define and deploy in a decision service will be driven by your organization’s business goals and objectives. For example, increasing the percentage of claims that go through straight through processing by 25%, decreasing equipment failures by 10%, or increasing offer acceptance rate by 15%. Once you deploy a decision to an operational environment, you monitor and track its performance against your business objectives to determine when you need to change the decision approach. Decision Management includes defining and reporting on KPI’s and metrics that measure the quality of automated decisions in relation to business objectives. 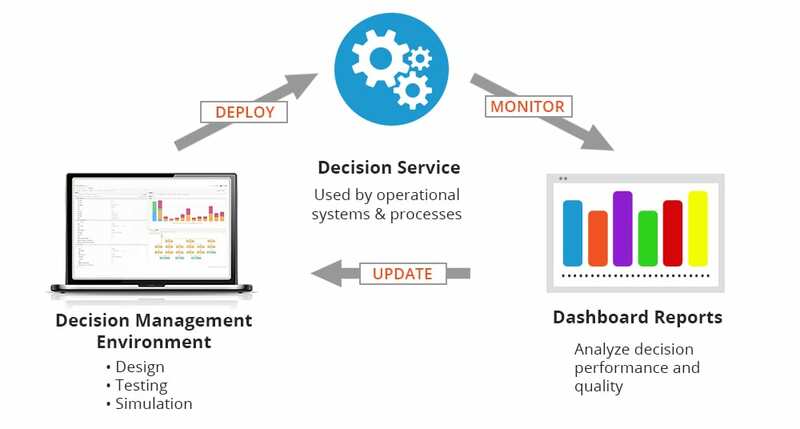 Decision monitoring and analysis allows organizations to track the success and effectiveness of the decision to enable ongoing improvements in how decisions are made. Sparkling Logic SMARTS is a decision management platform that empowers business analysts to define decisions using business rules and predictive models and deploy those decisions into an operational environment. 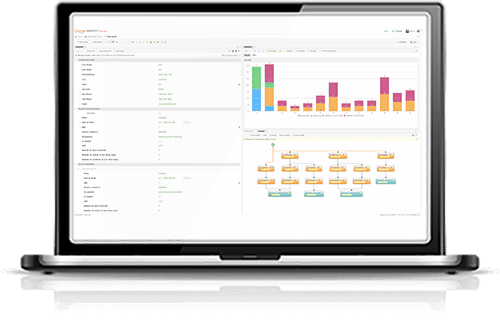 SMARTS includes dashboard reporting that allows organizations to measure the quality of decisions both during development and post deployment. Learn more about how SMARTS can help your organization improve decisions.  Ready to get started?